Full-service real estate, just keep more of your equity. It’s always a good time to sell when you’re saving big on commission by using a 1% real estate listing agent (aka seller’s agent). Don’t let the term “discount brokerage” mislead you. I don’t compromise on service just because the market – and technology – has changed the way we sell real estate. The level of service you’ll receive is indistinguishable from 3% brokers. You’ll just save, on average, a whopping $16,000. What could you do with that additional cash? Check out the locations I serve and contact me today to get started! Full-service real estate, just keep more of your equity. Serving single-family, multi-family, and commercial real estate customers. Savvy Agent: In-person, local, and dedicated – That’s me! 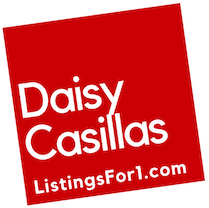 Daisy Casillas. Let’s get started! List your home for just 1% today! Auburn – Bremerton – Burien – Enumclaw – Fife – Gig Harbor – Kent – Lacey – Olympia – Puyallup – Renton – Tacoma – Tukwila – Tumwater – And many others! just keep more of your equity.